If one is going to divide wall systems into two basic types, they would be barrier and water managed. Barrier systems, as the name implies, are wall assemblies that are prophylactically impervious to water entry. Water managed walls, as you’re probably already guessing, take on some amount of moisture and through the magic of well considered details, collect that water and divert it back to the exterior. I’m not going to bore anyone with discussing barrier systems because they don’t work. Well, to be fair, they work sometimes, albeit poorly. They work very well in places where it never rains and winds don’t blow, which pretty much cans them in Chicago. 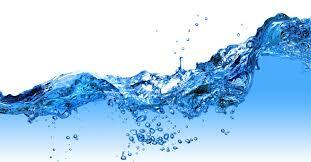 On to water management…..
All masonry is water managed. Old masonry in our town is solid load bearing; it’s completely solid from inside to outside. Each layer of brick from the inside to the outside is called a wythe. Old masonry managed water through the sheer mass of the wall. Our old masonry buildings are comprised of multiple wythes. 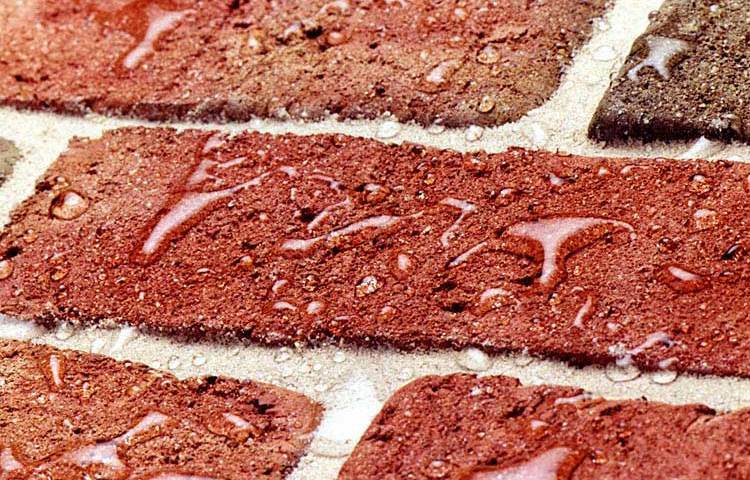 When pelted with rain, a lot of the water is deflected at the surface of the brick, a lot is absorbed, but only an extremely small percentage of that moisture gets through the first wythe. Of that small amount, an equally teeny bit of moisture gets past the second. What little moisture that does penetrate into the wall evaporates out (either to the interior or exterior depending on the time of year and relative humidity), and it doesn’t cause any appreciable problems, largely due to the vapor permeable nature of the material and the nature of old growth timber and the miracle of lime (more on the miracle of old growth lumber and lime in future posts). “New” masonry assemblies are called cavity walls. Calling this type of assembly new is a little odd because Vitruvius figured out cavity walls about 2ooo years ago, and we’re still messing them up for all sorts of reasons, but I digress. The various messes will be described soon enough. Image shows inner & outer wythes & cavity. 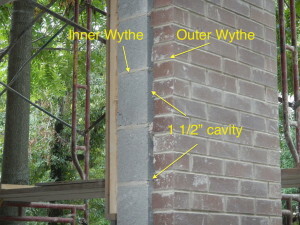 Cavity walls are two wythes separated by an air space. 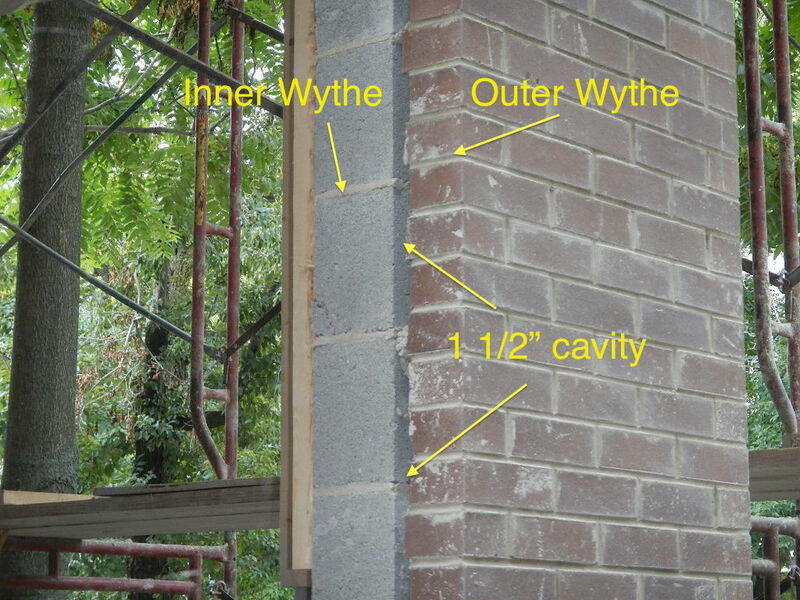 The idea in cavity walls is that water that makes it past the first brick gets to the air space, the water wicks down the inside face of the outer wythe, and strategically located flashing collects that water and drains it back to the exterior. OK, so why do we care about this? We care because we have developers and their masonry contractors repairing old stuff badly and building new stuff wrong. One indication of just how wrong is the proliferation of brand new houses that leak like sieves. They’re new buildings. They shouldn’t leak. Not even a little bit. The knee jerk response by builders and developers is to advise new owners to coat the brand new building with sealant, implying the problem is not with how it’s built but that the new owner isn’t keeping up with necessary maintenance. Pretty tricky, eh? This is one of the set piece deflections of responsibility seen all too often by builders and developers of houses that leak. 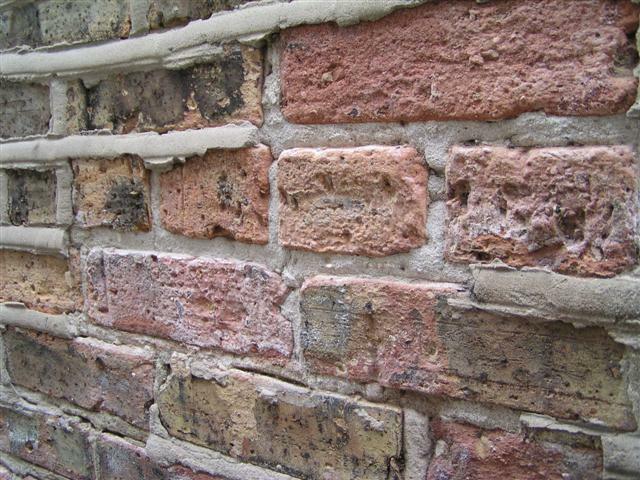 If you understand one thing, let it be this…..A properly constructed masonry wall should not need any sealant to work satisfactorily. 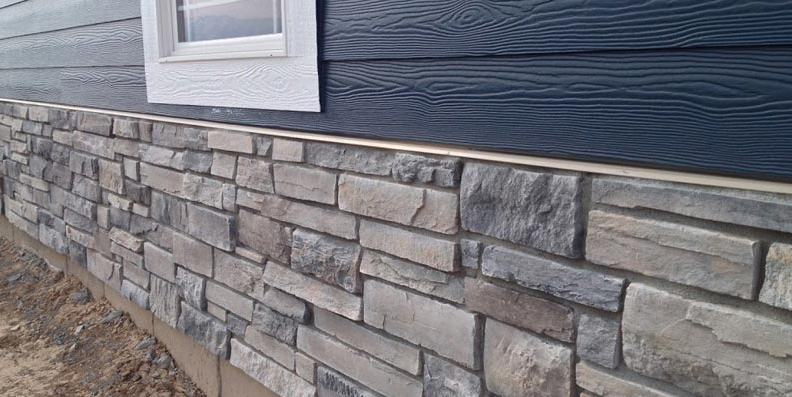 Sure, applying sealant to a new properly constructed building can be a nice thing to finish the job, but…..I’ll say it one more time….a properly constructed masonry assembly should not need sealant to work satisfactorily. Let the howling from builders begin…. After that, no new masonry building should need any masonry repair, let alone significant masonry repair, for at least 50 years. That’s why we build with brick fer chrissakes. As far as sealant, applying sealant to a new masonry building is attempting to turn a water managed wall into a barrier wall. Taking one type of wall (water managed) and attempting to turn it into another type of wall (barrier) with the application of sealant is lousy engineering. It’d be really cool if it worked, but if it did, we’d just forget all the complicated stuff and slam together bricks and coat them with sealant. Enough for now. I’ve exceeded my self imposed limit on word count. Volume II of this series describes specifics of how and why buildings leak.